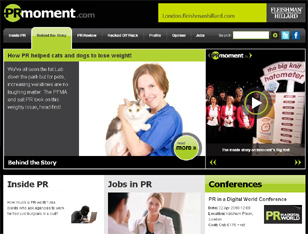 PRmoment is an online magazine for the Public Relations sector. The website provides an indepth looks behind the scenes of the PR industry, as well as highlighting best practice. The website also features regular reviews of the media from a PR perspective and of high profile PR campaigns, and finds out what it’s like to work in the sector. To inform and converse with it's rapidly growing readership, the website makes effective use of video webcasting technology as well as a blog and theTwitter and Facebook social media networks.